In this story we will see that God has great compassion for His children. Bathsheba is one of many women in the Scriptures that have been misunderstood or portrayed badly by scholars. We have already seen how the Jewish leaders have portrayed Tamar as a prostitute even though she was not one. Later we will see the same slur against Mary of Magdala’s reputation. That is why it is so important to read the Bible and see what God really says about these women. Hollywood likes to portray Bathsheba as a temptress. It sells more movies, but their version is not the same as the Bible’s. I believe that Bathsheba had no choice when King David had his men bring her to the palace. As a vassal and a woman she was not allowed to refuse the king. Some commentators want to cast Bathsheba as a seductress and blame her for David’s sin. But the Bible does not describe Bathsheba that way. Historians and Hollywood have often tried to say that the adultery was all Bathsheba’s fault. But Bathsheba was violated physically, then widowed, and bereaved of a child. God is compassionate. Bathsheba was comforted in her mourning. And then, miraculously God raised Bathsheba from the depths of sorrow to the heights of joy as He gave her another son. Her son would be the next king of Israel. Let’s turn to the story of this very blessed woman – Bathsheba. Normally, King David would have been with his troops. We are not told why he remained in Jerusalem. Perhaps his generals were doing an adequate job. The Israelite army was successful in destroying their enemies. Perhaps there was no need for David to endanger his life any more by leading the battles. Those who blame Bathsheba for David’s sin often try to say that she was bathing on her roof on purpose where the king could see her. That is not very likely. In the first place the Bible doesn’t say Bathsheba was on her roof; we are told that it was King David who was on the roof. That is the point to the story. He was standing where he could look down into the courtyard of Uriah and Bathsheba’s home. He should have wandered off and looked at something else and not violated Bathsheba’s privacy. It got him in trouble. Secondly, when David got up from bed it was night. How late was it? How dark was it? Bathsheba had every right to expect that she was bathing in the privacy of her own home at a time of the evening when she could expect to be alone. It was very unlikely that she was on her roof. Who would haul heavy water jars up there? Actually Bible historians tell us that bathing went on in people’s courtyards. Her maids would bring her water and attend to her behind a screen. She had every reason to believe she was having a private bath. The reason David could see her even behind a privacy screen was that he was on his rooftop looking down at her. David stood there and watched as this beautiful woman bathed. David could have looked away and respected Bathsheba’s privacy. Even if David had not looked away but indulged his lust by watching Bathsheba, he still could have turned and gone back to bed and forgotten about the whole thing. Instead he took steps to satisfy his lust. David sent a messenger to find out who she was. Who was Bathsheba? Let’s pause here and talk about Bathsheba. We know very little about her early life. Bathsheba’s father was Eliam, also known as Ammiel. Ammiel was ranked as one of David’s thirty-seven “mighty men” (2 Samuel 23:4). As such, Eliam or Ammiel would have been a frequent guest at David’s palace. Originally her father named her Bath-shua, which means “daughter of my prosperity”. Her later name, Bathsheba means “daughter of an oath” signifying the oath-bound covenant made with Abraham. Bathsheba was married to Uriah as a young woman. Uriah, a Hittite, was an officer in David’s army; in fact, he is listed with the 37 top-ranking heroes – one of David’s mighty men – (in 2 Samuel 23:39). Perhaps as one of the mighty men, Uriah met Eliam’s daughter Bathsheba in a gathering and asked for her hand in marriage. In any event, he was an important man. The fact that Uriah had a house in Jerusalem very near King David’s palace suggests that when the Israelites were not at war, Uriah’s peace time job may have been as one of the palace guards or even one of David’s personal body guards. It was the proximity of Uriah’s house that unfortunately made it possible for David to be tempted when he looked down into their courtyard while Bathsheba was bathing. David sent messengers to get Bathsheba. When David’s men told him that Bathsheba was the wife of Uriah, he would have known that Uriah (one of his chief men, remember) was away at the battle. He knew that Bathsheba was alone and helpless. Bathsheba could not refuse the king and David knew it. At this point David could still have let the matter drop, but he didn’t. When Bathsheba came, David lay with her. The Bible is clear – David lay with Bathsheba. He is the one who controlled the situation from first to last. Frankly, David sinned against Bathsheba. The Bible makes it clear that she was a victim. Bathsheba soon found that she was pregnant. This was a terrible situation for her. She told King David about her predicament. David knew he had to do something. So David sent this word to Joab: “Send me Uriah the Hittite.” And Joab sent him to David. When Uriah came to him David asked him how Joab was, how the soldiers were and how the war was going. Then David said to Uriah, “Go down to your house and wash your feet.” So Uriah left the palace, and a gift from the king was sent after him. But Uriah slept at the entrance to the palace with all his master’s servants and did not go down to his house. David decided to deal with the problem of Bathsheba’s pregnancy by getting Uriah home as quickly as possible. David thought that Uriah would naturally sleep with his wife upon returning home. Then the child would be presumed to be Uriah’s. David tried several times to get Uriah to go home, but Uriah would not think of his own comforts ahead of his duty. David then tried desperately to cover his sin. He sent a letter to his general Joab, in the hands of Uriah himself, to put Uriah in the fiercest place of a battle knowing Uriah would be killed. David added murder to adultery. Think for a minute of how far David went to cover up his sin. He had one of his best men killed. He involved his general, Joab, in participating with him in an unjust murder. When Uriah’s wife heard that her husband was dead, she mourned for him. After the time of the mourning was over, David had her brought to his house, and she became his wife and bore him a son. But the thing David had done displeased the Lord. Bathsheba mourned for her husband Uriah when she learned of his death. David had not only violated her physically, but now he also caused her to be a widow. Not only that but the laws in Israel were plain – a woman found pregnant out of wedlock was to be put to death. David raped her, made her a widow, and then put her in danger of her life. How lonely and helpless Bathsheba must have felt. 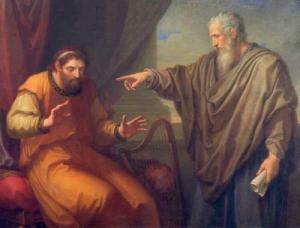 God was displeased with David and sent Nathan the prophet to speak to him. Nathan’s words are significant. The Lord sent Nathan to David. When he came to him he said, “There were two men in a certain town, one rich and the other poor. The rich man had a very large number of sheep and cattle, but the poor man had nothing except one little ewe lamb he had bought. He raised it, and it grew up with him and his children. It shared his food, drank from his cup and even slept in his arms. It was like a daughter to him. Nathan told David a story about a rich man with many flocks of sheep and a poor man with only one ewe lamb. The rich man needed to prepare a meal for a visitor and instead of using one of his own many sheep he took the poor man’s ewe lamb. David grew angry and said that the rich man deserved to die for his evil deed and should make restitution. Let’s look carefully at Nathan’s story. The metaphor he used is not an accident. The sheep in the story are adult animals. The ewe lamb is a baby. The lamb is vulnerable and depends on its owner for protection. Bathsheba was depending on her husband for protection, but he was away at war. Normally Bathsheba could rely on her strong husband, one of David’s mighty men, to defend her. Uriah would never have let anyone through the door to harm his wife. David knew Uriah was away and he took advantage of the situation to take Uriah’s one ewe lamb. If David needed to have some physical comforting, he had plenty of wives for that. At this time in his life, we know that there were eight named wives for David and many concubines. He did not need to find another woman. David understood what Nathan was telling him. He responded, “I have sinned against the Lord.” And Nathan told him that God had forgiven him since he repented. But sins have consequences even if God has forgiven them. The child that was conceived by this unlawful union died. Bathsheba must have mourned greatly over the death of her first child. David comforted Bathsheba after the death of this child. Bathsheba conceived again and bore a son and they named him Solomon. Bathsheba must have forgiven David. It must have meant a lot to Bathsheba when David repented publicly. This exonerated her. As a child of God she would have known that repentance and forgiveness are important. And as a godly wife it was important to her that her husband be right with God. Bathsheba could love, honor, and obey a man who turned from his sin and did what was right. In the next post we will see how Bathsheba reigned with her son Solomon to the end of her life. Scholars are divided in their opinions of Bathsheba. 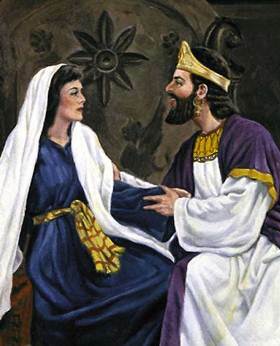 The main controversy seems to be over Bathsheba’s guilt or innocence in her involvement with King David. I am taking the position that Bathsheba had no choice when King David summoned her to the palace. As a vassal and a woman she was not allowed to refuse the king. Some commentators want to cast Bathsheba as a seductress and blame her for David’s sin. But the Bible does not describe Bathsheba that way. It was the “spring, at the time when kings go out to battle…” David should have been with his troops but for some reason he stayed home. During the evening “David arose from his bed and walked around on the roof of the king’s house, and from the roof he saw a woman bathing;” It was nighttime and Bathsheba was at her own home. She had every reason to expect privacy. It is not clear exactly where her bath was. Some portray her as on the roof of her home. But why would a bathing pool be on a roof? It is more likely that she was in an enclosed courtyard. It was the family’s private space. No one should have been peeping at her. David saw “a woman bathing; and the woman was very beautiful in appearance.” David could have looked away and respected Bathsheba’s privacy. Not only did he not turn away, he decided to take steps to get her for himself. “So David sent and inquired about the woman.” Even if David had not looked away but indulged his lust by watching Bathsheba, he could have turned and gone back to bed and forgot about the whole thing. Instead he decided to further his sin. “David sent messengers and took her,” When David’s men told him that Bathsheba was the wife of Uriah, he would have known that Uriah was away at the battle. He knew that Bathsheba was alone and helpless. Bathsheba could not refuse the king and David knew it. At this point David could still have let the matter drop, but he didn’t. When “she came to him he lay with her,” The Bible is clear – David lay with Bathsheba. He is the one who controlled the situation from first to last. Frankly, David sinned against Bathsheba. The Bible makes it clear that she was a victim. Bathsheba soon found that she was pregnant. This was a terrible situation for her. She told King David about her predicament. David decided to deal with it by getting Uriah home as quickly as possible. David thought that Uriah would naturally sleep with his wife upon returning home. Then the child would be presumed to be Uriah’s. But Uriah was a dedicated, disciplined soldier and refused the comforts of home while the other soldiers were “staying in temporary shelters, and my lord Joab and the servants of my lord are camping in the open field. Shall I then go to my house to eat and to drink and to lie with my wife? By your life and the life or your soul, I will not do this thing.” (2 Samuel 11:11) David tried several times to get Uriah to go home, but Uriah would not. David then committed another sin. He had his general Joab put Uriah in the fiercest place of a battle knowing Uriah would be killed. David added murder to adultery. Bathsheba mourned for her husband when she learned of his death. David had not only offended her physically, but he also caused her to be a widow. Not only that but the laws in Israel were plain – a woman found pregnant out of wedlock was to be put to death. David raped her, made her a widow, and then put her in danger of her life. Though David had sinned grievously, he was a “man after God’s own heart.” God sent Nathan the prophet to speak to David. David repented of his sins. When Bathsheba’s time of mourning for her husband was over David sent for her and married her. Sins have consequences even if God has forgiven them. The child that was conceived by this unlawful union died. Bathsheba must have mourned greatly over the death of her first child. But God is good and He helped David and Bathsheba have a good marriage after this. What could have caused such a transformation from a forced marriage beginning on shaky ground and grief of the death of a child to a marriage of happiness and joy? Bathsheba must have forgiven David. The Bible does not tell us much about how the two of them reconciled and truly fell in love and had a wonderful marriage. It must have meant a lot to Bathsheba when David repented publicly. This exonerated her. As a child of God she would have known that repentance and forgiveness are important. As a godly wife it was important to her that her husband be right with God. Bathsheba could love, honor, and obey a man who turned from his sin and did what was right. Bathsheba’s story reminds us of the kindness of God Who brings good things out of our sinful lives. Yes, there are consequences to our sins, but God moves on after His forgiveness giving us blessings. There is always hope for a better future.